Yucatan-style green achiote paste with ground young annatto seeds and spices. 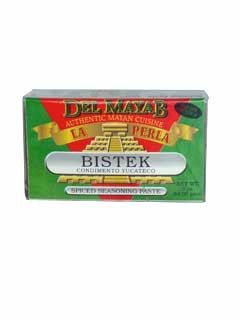 Bistec or Bistek. Achiote Condimentado, also known as �Recado Rojo,� is a special blend of exotic spices that uses the annatto seed as its main ingredient. This special combination of ingredients produces the unique and marvelous flavor of Del Mayab Achiote; a versatile addition to cooking that makes many dishes come alive with the unforgettably distinctive taste of authentic. Pasta verde de achiote estilo Yucat�n con semillas de achiote tiernas molidas y especias. annato La Perla del Mayab. I really like this barra to add to the marinade for beef fajitas or other beef recipes. I think the red achiote is really good for pork, chicken and fish, but this achiote verde is much nicer on beef. The flavors just seem to meld very nicely. As with the red barra, a little goes a long way, so I generally use much much less than is suggested on the package, usually 1/5-1/6 barra for a marinade that is made with 1/3-1/2 c lime juice or other citrus.